We’ve had a few projects finally get completed recently. 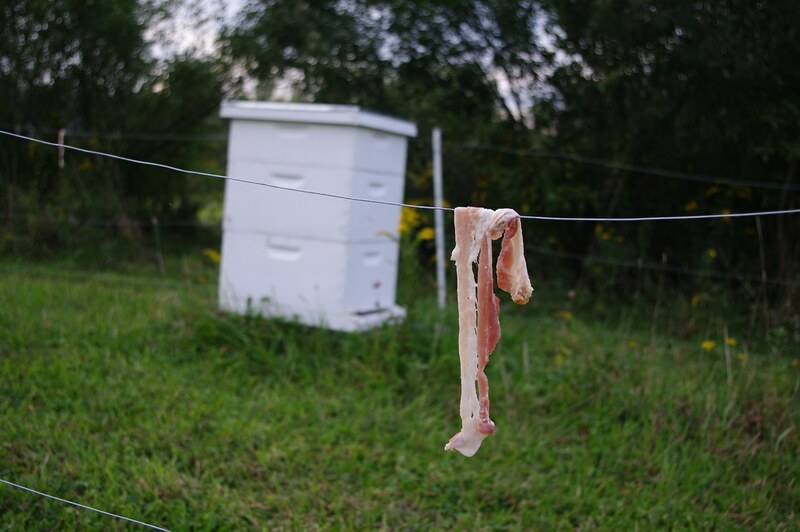 Among them, the nest box and this brand new bacon-flavored electric fence. Why bacon flavored? We’ll explain. As you may remember, bears have menaced the bees in the past. Nick finally got around to taking action by setting up an electric fence. These are rather interesting devices that are much simpler than expected to set up. Basically, electric charges lasting about 10 microseconds are sent down the fence wire. It is not a constant pulse because (A) it would kill the battery sooner and (B) it would cause more harm to animals/people (a constant pulse could potentially lock a mouth or hand on the wire). The fence wire itself is NOT grounded, so this is like sending an electric pulse around a closed loop — not a lot of energy is lost. When a bear (or anything else) touches the fence, it completes a circuit between the wire and the ground. Electricity flows through the inquisitive bugger into the ground, delivering blasts of shocks until they let go. Because bacon makes everything better, you can also employ it for bear-defense. In this case, it’s used to bait the bear into biting the fence. The shock should be enough to keep it from coming back in the future. Without bacon, a bear could lumber through the fence, just getting angrier for the shocks on the way through. Angry bears = more damage, so we want to avoid that. By biting the bacon, the bear receives a shock (represented as a ZAP in the above diagram). This causes cognitive dissonance in the bear, who comes to understand that bacon, previously his great and dear friend, has become something to be feared. Because bears don’t fully grasp the workings of electricity, they believe that only a source of great dark power can cause something as wonderful as bacon to become so painful an indulgence. One hopes that the bear believes the beehive is the source of this power, their own personal Eye of Sauron, thus fleeing the area. So yeah, that’s how we think the whole thing works from a bear’s perspective. From our viewpoint, it’s a little more straightforward. 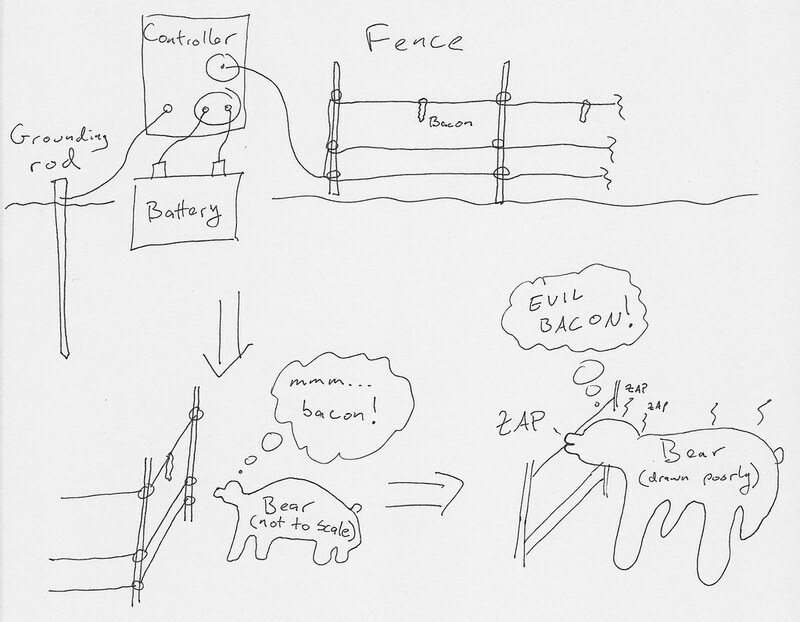 If you, like us until very recently, have never encountered an electric fence, here are some pictures of our setup. You can click the pictures to see bigger versions at our Flickr site. 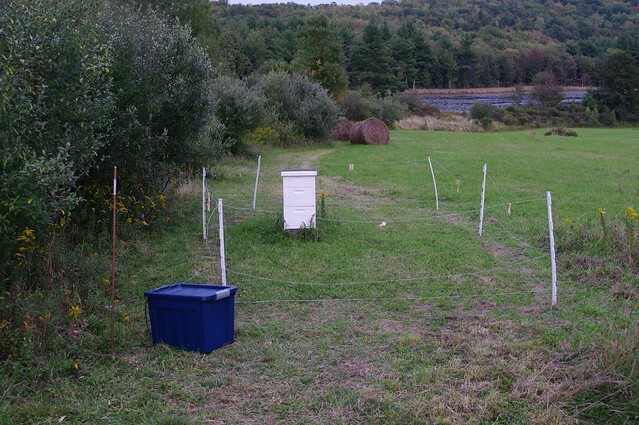 You can see the fence, complete with bacon, surrounding the hive. 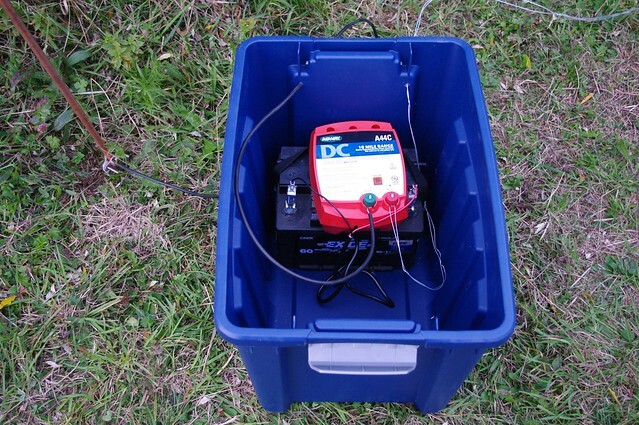 The blue box contains the battery and controls, and the copper grounding rod is to the left of the box. The box is necessary to keep everything out of the elements. Here’s a close up of the fence controls. We’re running on a used car battery — it’s not strong enough to actually work in a car anymore, but it does hold a charge well enough to power the fence for a few days at a time. We’re hoping to get a second battery soon so one can charge while the other works. In an ideal world, we’d have a solar powered set up, but that adds over $100 to the cost of the system. As it stands, the whole fence cost us right around $100 to set up. The controller was the most expensive, at $65, and we did have to buy waaaaay more wire than we needed. The smallest quantity we could get was a mile(!). And that’s our electric fence. If you have any questions about our set up, or if you know how to do things better, let us know in the comments!